How do I provide nesting sites for bumblebees? Nest sites vary between bumblebee species. Most of the more common species prefer dry, dark cavities and nests can turn up in a variety of unexpected places. Some nest underground, in places such as abandoned rodent holes, under sheds and in compost heaps. Of those that nest above ground, some make nests in thick grass, while others make nests in bird boxes, lofts and in trees. One of the species which nests in bird boxes and lofts is the Tree bumblebee (Bombus hypnorum). With this species you may often see ‘swarms’ of bees flying around the nest (see the video at the bottom of this page). This is perfectly normal, and these are male bees, which often fly around nests, waiting for queens to come out so that they can mate. Male bees cannot sting, so please don’t be alarmed if you see this. When searching for a nest, the queen will investigate the environment using both sight and smell. When she finds a potentially suitable site she will investigate by going into the hole. If it proves unsuitable she will continue searching until she finds a nest site. The low-flying zig zag flight of a nest-site searching queen is seen in spring and is very distinctive. In gardens, bumblebees tend to nest in relatively undisturbed areas such as shaded corners. Some will also nest under structures such as sheds. They do not like to nest in areas with prolonged exposure to the sun as this can heat the nest too much. Bumblebee nests vary in size depending on the species and time of year. A well-established nest may contain up to 400 bees. Honeybee hives typically contain 50,000 bees so bumblebee nests are very small in comparison. You can help bumblebees by providing them with somewhere to nest. The first step of course is to provide lots of the right kinds of flowers in spring. At this time of year the nest-searching queen will be attracted to gardens where she can find plenty of food to help her produce her first batch of eggs. For information on the best flowers to plant for bumblebees, visit our Bee kind tool. Once she is ready to lay, the queen will start looking for a nest site. She flies low over the ground in a zig-zag pattern, stopping to investigate holes in the ground, or piles of leaves. 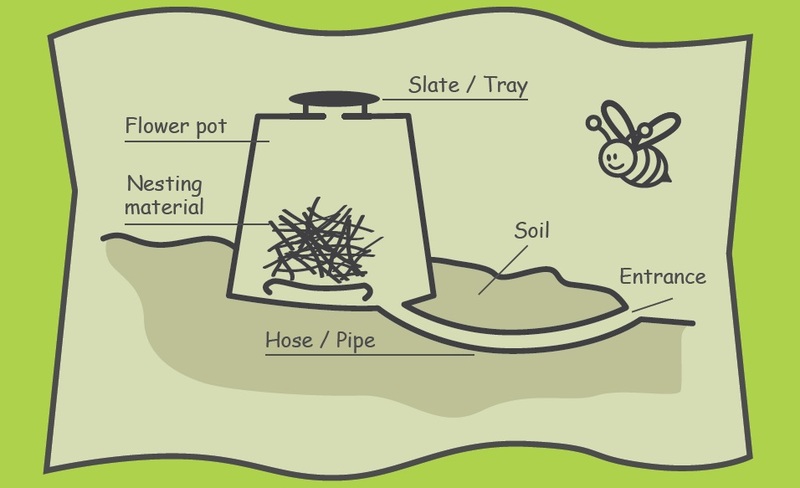 We have teamed up with Hartley Botanic to create a guide to making bumblebee nests in your garden. 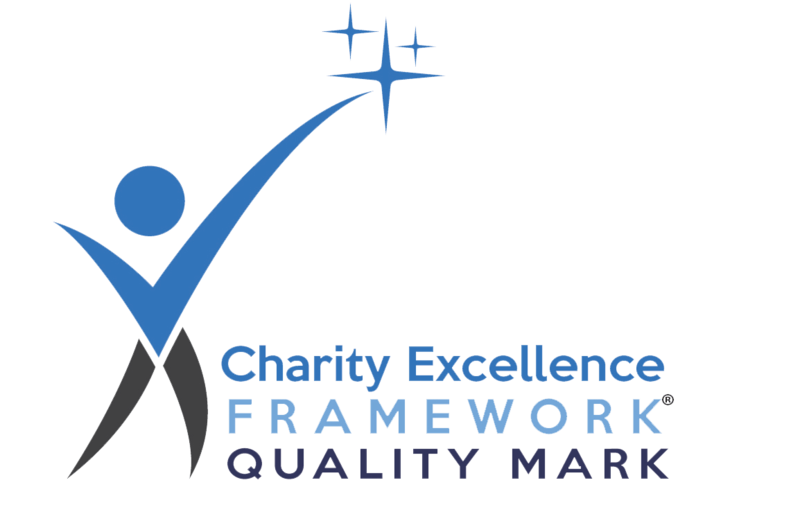 Click here to download the guide (pdf, 2mb). It can be quite difficult to encourage bumblebees to nest in a specific place – even specially designed nest boxes have limited success. However, here is a design to build a suitable nesting site in case you want to give it a go. Sink the upturned flower pot into the ground and use the slate/ tile to cover any drainage holes to keep the rain out. Run a hose or pipe underground to the pot, leaving a prominent entrance. Be sure to make drainage holes in the pipe. Finally, fill with a generous handful of nesting material, such as old bedding from a pet mouse, guinae pig, etc. Inside a bumblebee nest will be a queen bee, who lays almost all of the eggs. Around her, she will have a number of worker bees, who help to look after the nest, collect food, and raise new offspring. 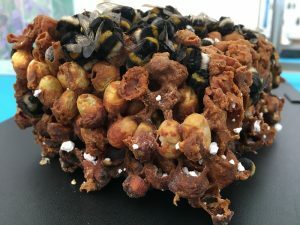 Unlike the distinctive honeybee nest, which has tightly packed hexagonal cells for raising offspring and storing honey, the inside of the bumblebee nest can appear quite messy and disorganised. Bumblebee nests can look quite untidy. You might also find a number of dead bees and grubs near the nest entrance. This is because worker bees will remove dead and dying bees from the nest to keep it clean and free of disease. If you find a bumblebee nest, consider yourself very lucky! They aren’t very common, and can be difficult to find. Download our essential guide to bumblebee nests here. We recommend that if you find a bumblebee nest, it is best to leave it alone and avoid disturbing it. If you do approach close to it, be sure not to breathe on the nest, as this can make the bees behave defensively, and they may sting. Please note that though bumblebees are not generally aggressive, they might get aggravated if you interfere with the nest itself. They don’t form swarms, but you may see a cloud of male bees flying outside the nest, as in the video below. They should just get on with life and do their own thing – doing a wonderful job of pollinating plants, wildflowers and your vegetables. Even the very largest nests produce very little “traffic” in and out, so you won’t see threatening numbers of bees at any point during the summer. If the bees are living under your shed, and are coming up through holes in the floor, then this is probably because it’s the easiest way in and out for them. If you make a different hole, from the outside of the shed, and then block up the hole they were using, then they should happily take to their new route. Bumblebee nests don’t live for long, so the nest should die naturally within a few months. After that time, the new queens will have flown from the nest to hibernate in the soil elsewhere. It is possible that a different bumblebee queen will find and use the same hole next year. The old nest will die in the autumn though, and all the bees will have left or died. If you don’t want bees in the same place again you can block the entrance to the nest up after it dies down to prevent a new queen finding the nest site in later years. Below is a video is a ‘drone cloud’ – a group of male bumblebees hovering outside a nest waiting for females to emerge so they can mate. This behaviour is only found in the Tree bumblebee (Bombus hypnorum). The males have no sting, so please do not be alarmed if you see this. We very much hope that people will only try to move nests that are in a particularly inconvenient locations. Underground nests will be difficult to move, as you’ll create a considerable amount of disturbance as you dig down to the nest. These nests can also have long tunnels that lead to the nest, so can be difficult to find. Staff from Bumblebee Conservation Trust do not move bumblebee nests. If you do need to move a nest you will either need to do this yourself or get help from someone experienced in doing so. Please note that bumblebees can sting and are more likely to do so if their nest is disturbed. If you decide to move a nest, it is done at your own risk. Some honey bee-keepers will have some experience in moving bumblebee nests, but this is rare. 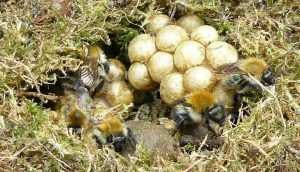 Pest control companies often destroy the nests (although a few refuse to), so it’s best to avoid using their services for bumblebees unless absolutely necessary. A few companies now specialise in moving nests. While we are unable to recommend any of them, they can be found through search engines. To move a nest safely it is best to do it in the dark – when all of the bees will be in the nest and docile. They might buzz a bit but they won’t fly in the dark, so it’s safest to do it then. They don’t see red light well, so if you need to see what you’re doing, put some red plastic film/acetate over a torch or use a red L.E.D. rear cycle light. Bumblebees are less likely to sting than honeybees and wasps are. However, disturbing the nest can make them behave defensively, and precautions should be taken to prevent stings occurring. While a full bee-keepers’ suit is helpful, it is not necessary. As a minimum, a person moving a nest should wear full length rubber ‘washing up’ gloves, and a long-sleeved top, and cover any exposed skin as best they can. It has also been found that bumblebees can become alerted to the presence of an intruder if they are breathed upon. Accordingly, it is best to try to avoid breathing on the nest. Wear protective clothing, especially gloves. Take a note of where the nest is and how you will reach it when it is dark. Wait until all or most of the workers have returned – this is often well after dusk. When activity quietens down, block up the entrance hole with flexible foam (e.g. from a sponge or scouring pad). Seal up any holes you find around the box using tape, as bumblebees can easily use these to escape from the box when it is being moved. Take the box down, without tipping it over, and keep it on a flat surface until you are ready to move it. Carefully move the box to its new location which should ideally be within a few feet of the old site or over 1km away – see our nest FAQ for more info. It should be at least 5 ft. off the ground and attached to a surface that is not liable to vibration, as this can disturb the bees. Remove the bung the next day, and the bees will leave to explore their new area. It is best to leave it until after midday to remove the bung. You can read more about the fascinating lives of Tree bumblebees in this article written by Clive Hill. Click here to read it (pdf, 650 kb). Bumblebees sometimes nest in places from which it is difficult to remove the nest without killing it. Porches, wall cavities, air vents, eaves and roof soffits have all been recorded. Because of the difficulty in reaching into these places, removing the nests from them cannot be done without help from someone experienced in moving bumblebees. In these cases, it is important to remember that bumblebees don’t cause any damage to homes. They do not eat wood (like wasps do), and don’t leave behind a big mess. If you can put up with living with the nest nearby, it should die naturally within a few months, and the bees will all leave or die at the end. If you don’t want bees nesting in the same place the following year, block up any entrances to the nest and other suitable nest spaces nearby. If the bees are being bothersome by entering and leaving the nest (e.g. in porches, where they usually fly at head height), you can try to re-route the entrance of the nest using our advice, below. It is much easier to re-route bumblebee nest entrances to make the bees enter and leave in a different place than it is to move the nest entirely. This is especially useful if the entrance hole brings the bees into close proximity with people. To do this, get a length of flexible tubing that is at least 2cm in diameter. The type of tubing used in sink waste pipes works perfectly. Then, attach the tubing to the nest entrance. Make the junction between these as tight as possible, to avoid having bees coming out of the wrong place. Gaps can be plugged with soil. Then place the other end of the tube wherever you want the new entrance to be. Secure it in place as best you can, and place some ‘landmarks’ around it. The bees use landmarks to navigate, and whenever they leave the nest they will fly around the hole to memorise what features are around it. Anything can work as a landmark, but pebbles, plant pots, etc. all work well. 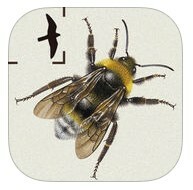 Now all you need to do is sit back and enjoy the bumblebees in your garden! Did you know, if you use Amazon via this link, Amazon will donate 8% of the purchase price to the Trust?